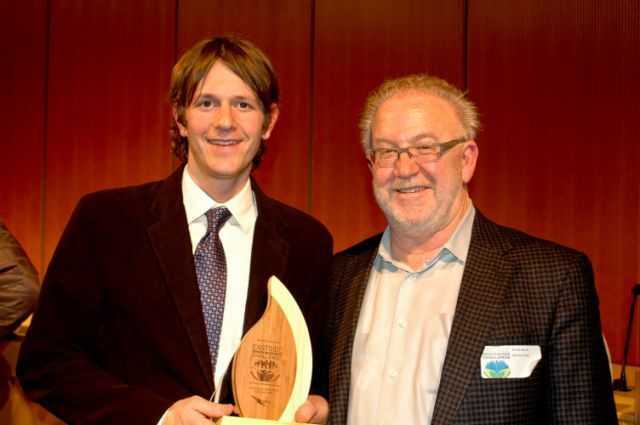 Renton, WA – February 8, 2013 Service Linen Supply wins the 2012 Eastside Green Business Challenge for Business Services–Green DNA Award. Participants in the Challenge completed a sustainability performance scorecard demonstrating the level of environmental and community improvement measures being practiced by their organization throughout 2012. Award Ceremony Photo (left), pictured from left to right: Bellevue Councilman John Stokes and Service Linen Supply’s Co-President David Jassny. Award Ceremony Photo (right), pictured from left to right: City of Bellevue’s Program Administrator, Paul Anderson and Service Linen Supply’s Co-President, David Jassny. Photo Credit: LeAnh Mai. The program had set ambitious targets for cost savings ($2 million) and reductions in greenhouse gas emissions (10,000 metric tons) among participating businesses. When the final results were tallied, businesses reported $1.9 million in savings and a reduction of over 13,000 metric tons of carbon dioxide equivalent from energy savings alone – that’s 2,895 cars taken off the road for one year! In addition, businesses reported saving over 1,000 tons of solid waste and 53 million gallons of water – equivalent to 80 Olympic size swimming pools. This is one of several awards Service Linen has recently won for its leadership in sustainability and conservation practices that protect our Puget Soundgreen. Service Linen was selected as one of the top 50 greenest companies by Seattle Business Magazineand received statewide recognition winning the 2012 Environmental Excellence Award from the Association of Washington Businesses (AWB). Additionally, Service Linen Supply received one of the first TRSA Clean Green Certifications, which recognizes linen rental companies that demonstrate responsible leadership in sustainability and conservation to protect the environment. Service Linen Supply is also a founding member of the Laundry ESP (Laundry Environmental Stewardship Program), which utilizes community partnerships to help reduce its commercial laundry’s water, energy, and washroom detergent usage. Service Linen Supply is a family-owned local business that has been serving the Pacific Northwest’s linen and uniform rental needs for over 65 years. Renton Laundry was founded on the current site in the early 1900’s. The business was sold to the Jassny and Raphael families in 1946. Service Linen employs more than 130 team members who serve more than 3000 customers in Washington and Oregon. With a focus on clean, green initiatives, the Service Linen team has traveled the world to discover the latest laundering technologies for efficiency and productivity. Service Linen Supply Recognized for Track Record of Veteran Hires; Says Yes to Vets.